A New Scent and a New Size! 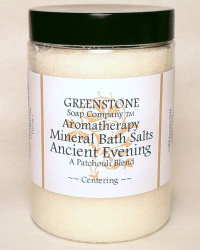 A soothing blend of salts, essential oils and minerals. Made with natural Sea Salt, Epsom Salt, Sodium Bicarbonate, Fractionated coconut oil with pure essential oil of Bergamot and Lavender. 10 oz. 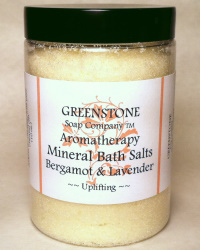 A centering blend of natural sea salt, mineral salts, fractionated coconut oil with our proprietary blend of pure essential oils featuring Patchouli. 10 oz. 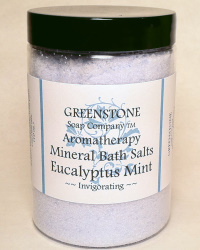 A decongestive and invigorating blend of natural sea salt, mineral salts, fractionated coconut oil and pure essential oils of Eucalyptus and Spearmint. 10 oz. 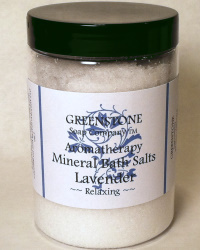 A relaxing blend of natural sea salt, mineral salts, fractionated coconut oil and pure essential oil of Lavender. 10 oz. 10 oz. 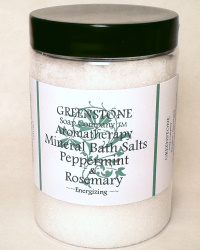 An energizing blend of natural sea salt, mineral salts, fractionated coconut oil and pure essential oils of Peppermint and Rosemary. 10 oz.